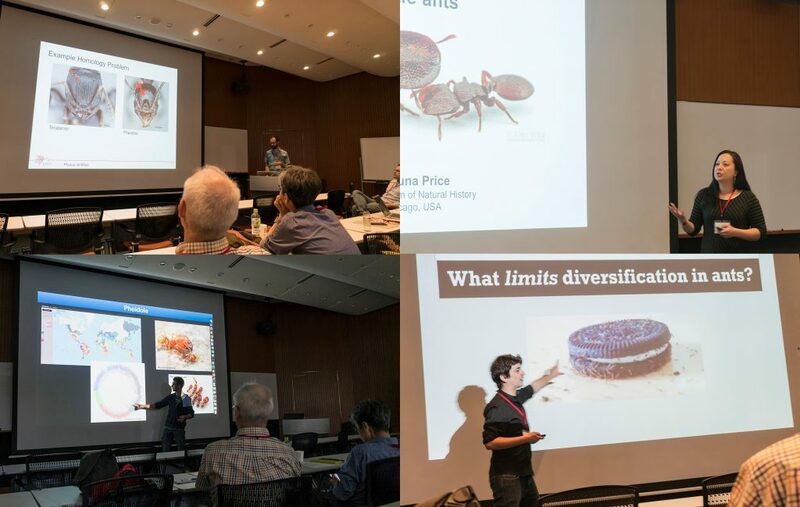 Last week our lab hosted an OIST Mini Symposium titled “Advances in imaging, quantifying, and understanding the evolution of ant phenotypes” organized by Evan Economo and Francisco Hita Garcia. The aim of the symposium was to gather a small but selected group of leading researchers interested in the evolution of ant phenotypes with a strong focus on the use of x-ray microtomography (micro-CT). Our list of speakers covered experts in the fields of molecular and morphological systematics, anatomy, functional morphology, comparative morphology, adaptive trait evolution, reproductive biology, linear and geometric morphometrics, and paleontology. 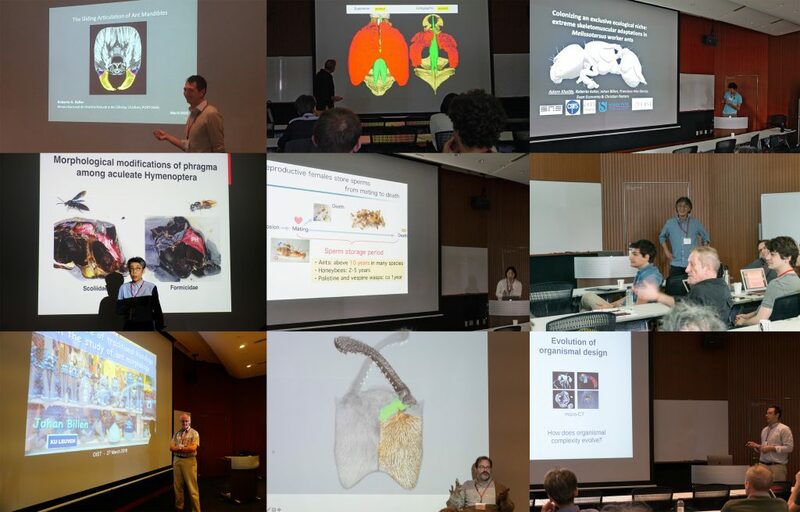 All invitees gave outstanding talks and presented published or ongoing research in great detail and with beautiful 2D or 3D illustrations and/or videos. 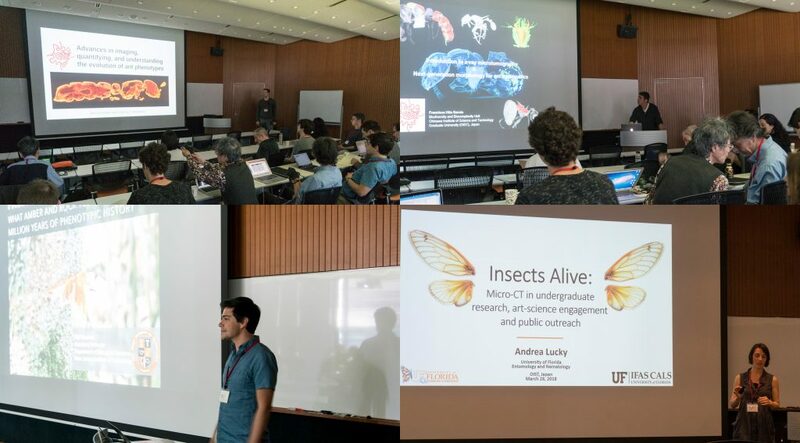 Some talks provided conceptual and technical backgrounds and perspectives of how to use micro-CT for ant morphology, how to better integrate next-generation phenomics into systematics, palaeontology, and evolutionary biology, and how to use micro-CT data and downstream 3D applications for education and public outreach. 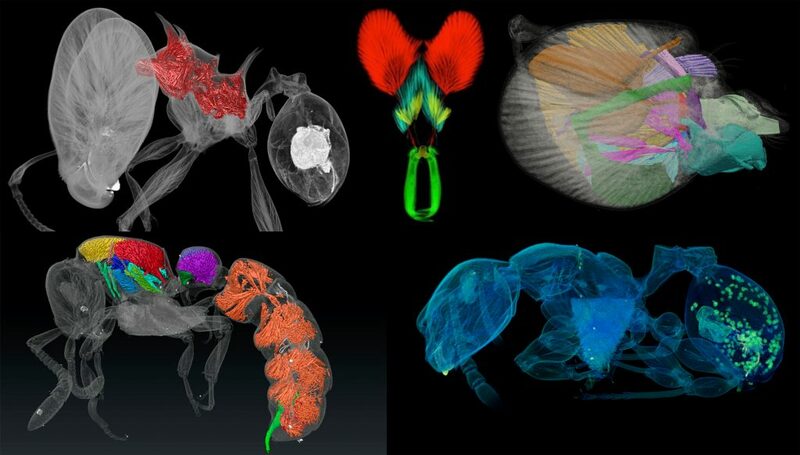 A strong focus of the symposium was the use of micro-CT for ant functional morphology, biomechanics, and the evolution of complex phenotypes. Some guests also showed recent advances in histology-based anatomy and reproductive biology, and shared ideas of how to combine traditional histology with modern 3D imaging technologies, such as micro-CT.
We also had a session focusing on the use of 2D linear and 3D geometric morphometrics and their application for ant phylogenetics, taxonomy, trait evolution, and more generally how to use large 3D phenotypical datasets to answer questions in evolutionary biology. 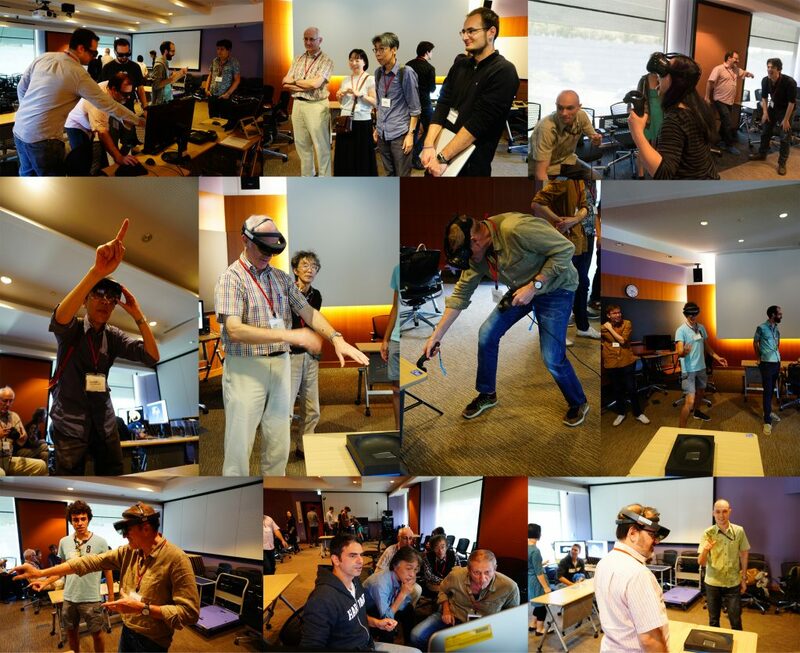 One afternoon was completely devoted to practical demonstrations of how to use 3D data. Our lab shared how we scan data post-processing, 3D virtual reconstructions, 3D animations, virtual/augmented reality, 3D printing. It was useful for sharing knowledge of methodology, and stimulating ideas for future directions and applications. The three-day symposium provided ample opportunities for socializing and chatting about on-going and potential collaborations, discussions about methods and research results, as well as brainstorming about future directions for the field. At the same time our invitees got the chance to enjoy Japanese and Okinawan culture and cuisine and show off their Karaoke skills. How would you like to be in the same room as an ant the size of a horse? In reality that’s a ridiculous idea, but in augmented reality anything is possible. 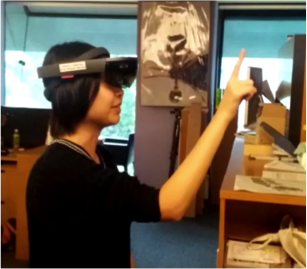 This week, OIST’s Biodiversity and Biocomplexity Unit tested a new augmented reality device: the Microsoft HoloLens. Pavel Puchenkov of OIST’s Scientific Computing & Data Analysis Section designed a demonstration using a 3D-scanned model of the newly discovered ant species, Pheidole drogon. 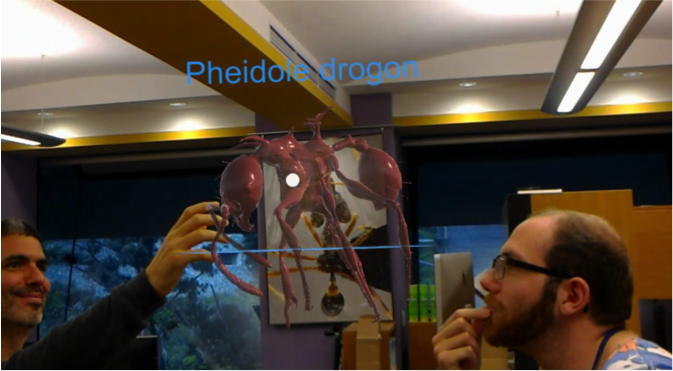 With the HoloLens, researchers were able to explore this species’ exceptionally spiny shape. While the applications available for the HoloLens are currently limited, the opportunities quickly become apparent. The ability to display holographic renderings of specimens in 3D has the potential to turn any room into a stunning museum exhibit. It’s clear that this technology has the potential to create or enrich experiences that we can use to communicate life’s diversity and evolutionary history. Ph.D. Student Yuka Suzuki interacting with objects in augmented reality.